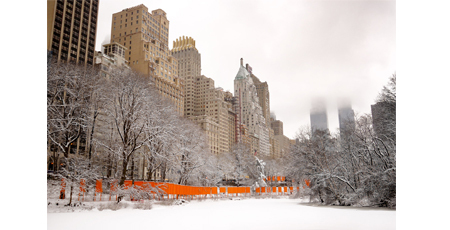 Ten years ago this month, we wrote At The Gates, an appreciation of Christo and Jeanne-Claude's Central Park installation. In honor of their work, we reprint it below. Coincidentally, the day it ran was the first day MUG began running joes nyc, the daily image of New York by Joseph O. Holmes. 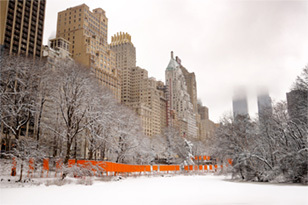 The image above, titled The Gates, Central Park Pond, is by Joe, and prints are available from 20x200 until noon today. We bought ours! As each of the sheets unfurled, the pouches overhead released a long cardboard tube, which hit the ground with a satisfying pop. One by one, "The Gates" fluttered to life. People gathered, applauded. By late morning, you could feel the full effect of Christo and Jeanne-Claude's gift to New York; even the overcast skies lifted. Not all churls were convinced, but that was a gift to them, too. Old photographs of Central Park freeze, say, a group of skaters (the lonely outpost of the Dakota in the background) and become part of our collective memory, an entry in the city's daily journal. So it was that each emerging flag, with its entourage of upturned faces, seemed to pause for a moment, as if waiting for the thhwp of an early photographer's magnesium flash, ready to join the archives for future New Yorkers to contemplate. Flooded with these sentimental images, why, then, could we not get September 11th, of all things, out of our head? Finally, after a long afternoon stroll in the park, we understood: "The Gates," can be seen as the unexpected antithesis of September 11th, its emblematic inverse. "The Gates" is the first truly citywide event since September 11th, a malign and permanent transformation of space on the one hand, a benign and temporary one on the other. From people born outside our shores, one was done to us, one done for us. September 11th was a vertical event; this installation encourages you to see horizontally, to reframe the landscape with its proscenium arches and show curtains. Terrorists cast ashes over a golden morning, artists launched patches of orange under ashen skies. Over two decades in the making, it is clear that "The Gates" was in no way conceived in response to September 11th. But it is possible to see both in the anodyne beauty of the work, and in its embrace, the joy New Yorkers took in the hoisting of thousands of flags—none of sovereign nations—each piece of Vinyl a semaphore of wonder, a bright bloom of hope.